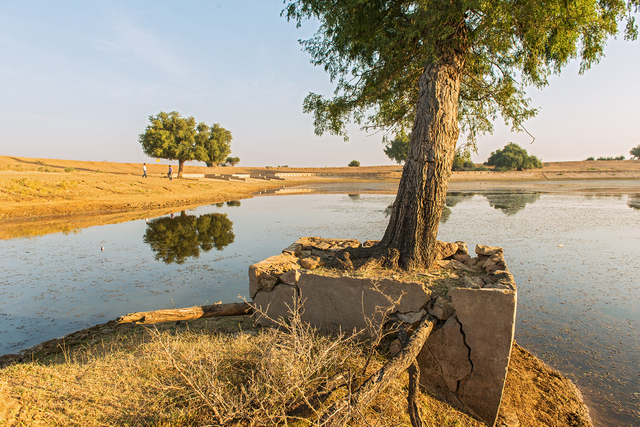 In Western Rajasthan, rainwater harvesting system is very ancient and is sustainable mean of water security. 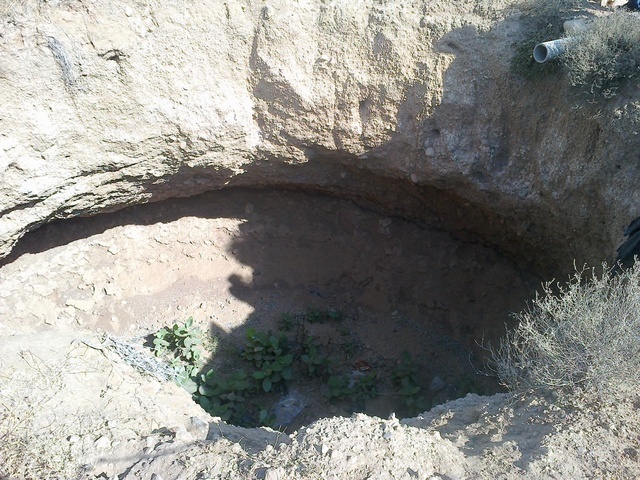 Underground Taanka and Beries are such structures for harvesting rains. GRAVIS promotes these structures by technical improvement and renovation. Kishneri village was chosen to have the mill for producing lime as well as having beries renovated here. 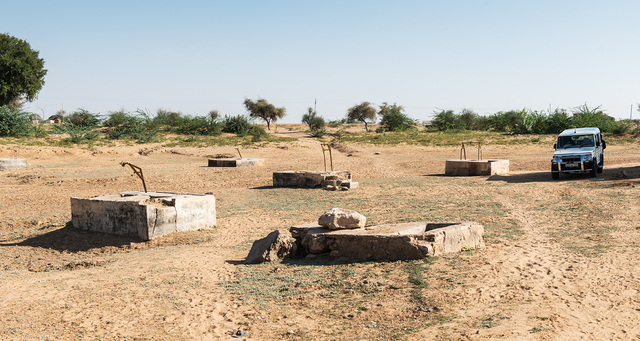 2 Beri and 1 Taanka were constructed in the Kisneri Village. The top of the BERI is now strong enough and will not damage due to rain and excess water flow. Constructed Taanka has brought the happiness on the face of Samda Devi (beneficiary). Around 5000-6000 liter of water is stored in beneficiary Taanka due to rain. 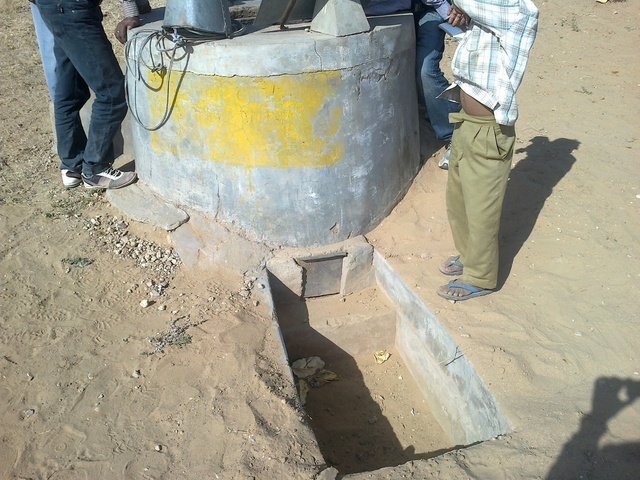 The rain water harvesting taanka for beneficiary Sanwantaram has been completed. 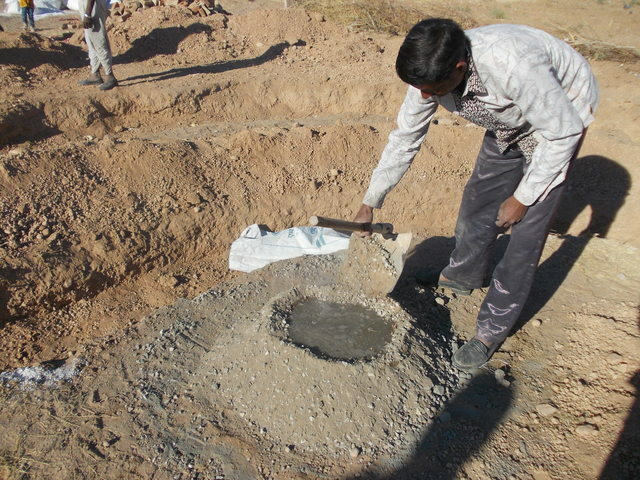 The taanka has been made of lime. 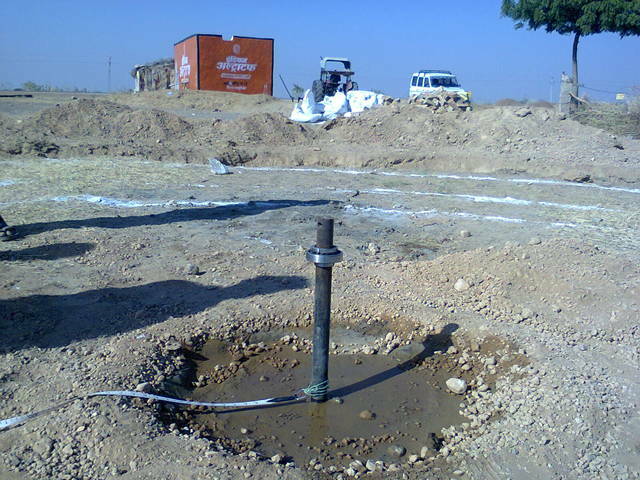 The tanka will harvest rain water during monsoon and can store up to 20000 liters of water. 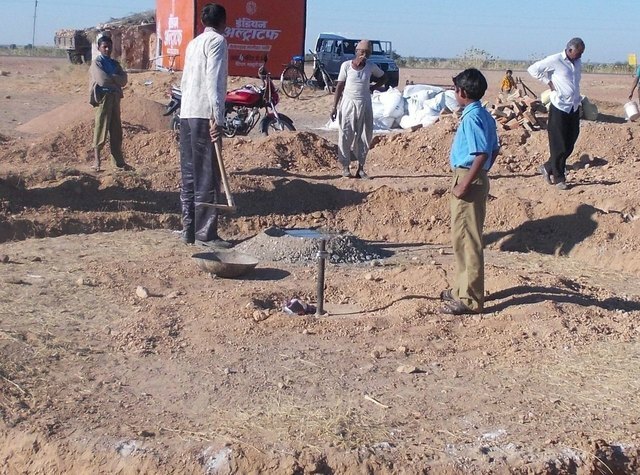 Construction of Taanka Superstructure in progress of beneficiary Sanwantaram s/o Siyaram. About 10 feet superstructure construction has been done and in a few days the top structure will be completed. The superstructure construction is being done in intervals so that the lime structure can settle down properly and the stones can be joined strongly. Although it is increasing the mason and labour cost but still we have to do it to bring strength to the structure. 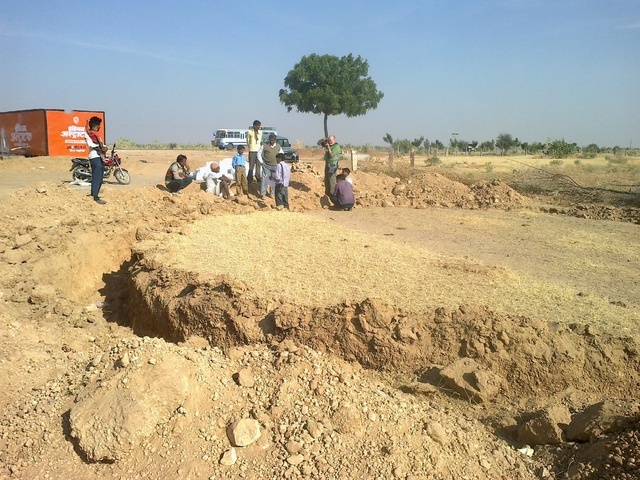 Taanka superstructure for beneficiary Sanwantaram s/o Siyaram is in progress. About 6 feet superstructure has been completed. The taanka super structure construction is in progress. The preparation of mortor has been done but due to rain the construction work has stopped from last few days. 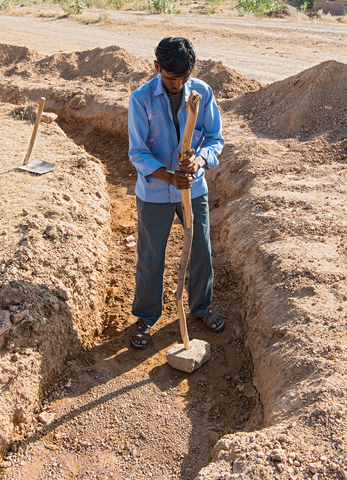 Pit Digging has been completed for Beneficiary Sanwantaram s/o Siyaram. 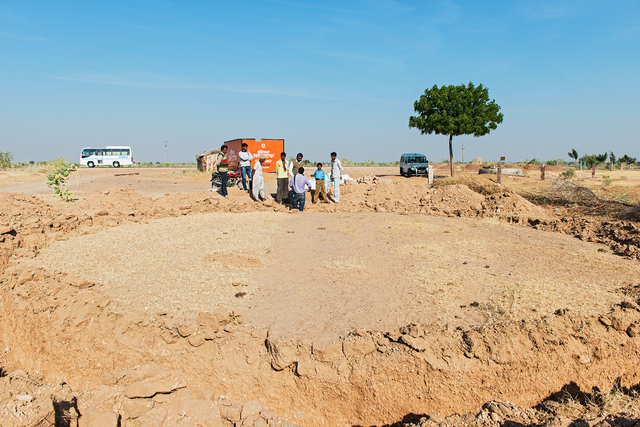 The construction of super structure of taanka will be made with lime. 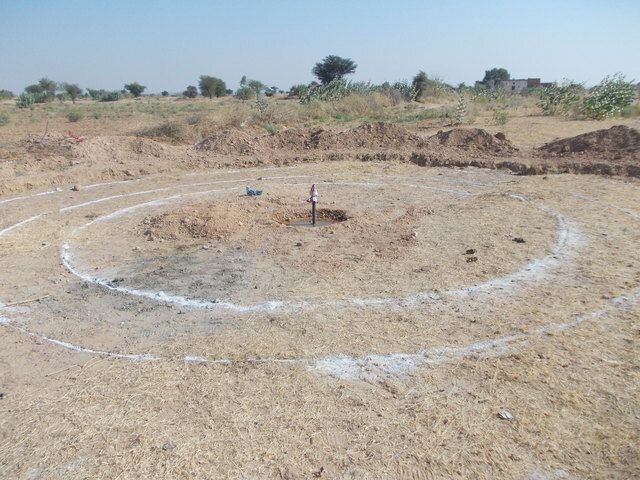 We have planned to construct a Taanka out of lime in Kishneri village near the Grinding mill. 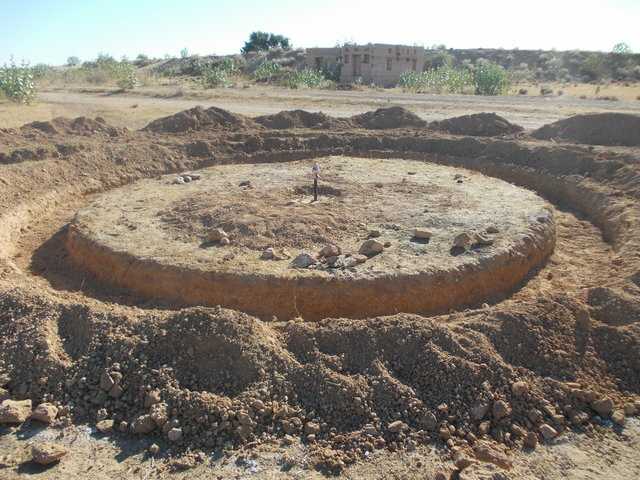 The Taanka near to the Grinding mill in the same village will be as a model demonstration Taanka for the project and future purpose. The pit digging of the taanka has started. The beneficiary is Sanwantaram s/o of Siyaram belonging to Meghwal community having 5 family members. 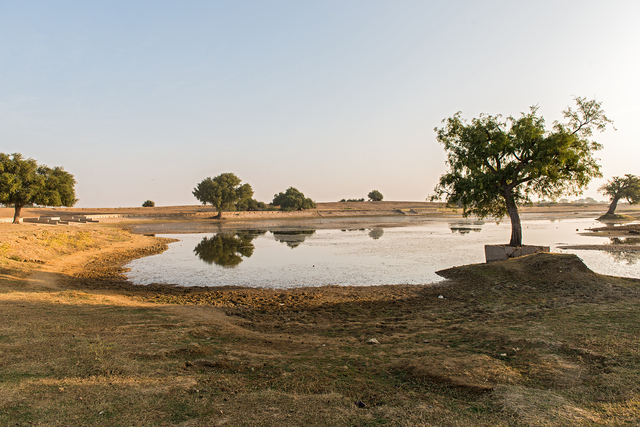 A Beri has been renovated in Kishneri village. 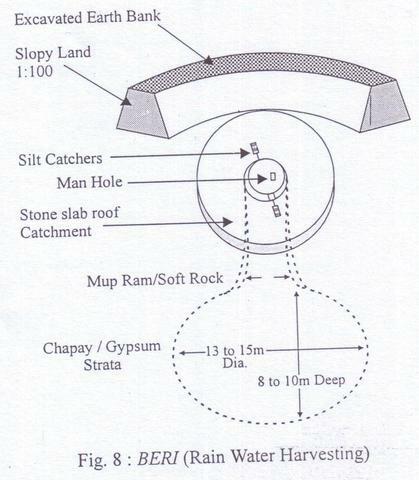 The lime mortar has been used for construction of the superstructure and silt catcher. The internal wall has also been plastered with the use of lime mortar. Before the super structure construction the de-silting work of beri was done by excavating the settled mud & silt inside the beri. Due to unavailability of cow the work is getting delayed. The lime grinding has started now. 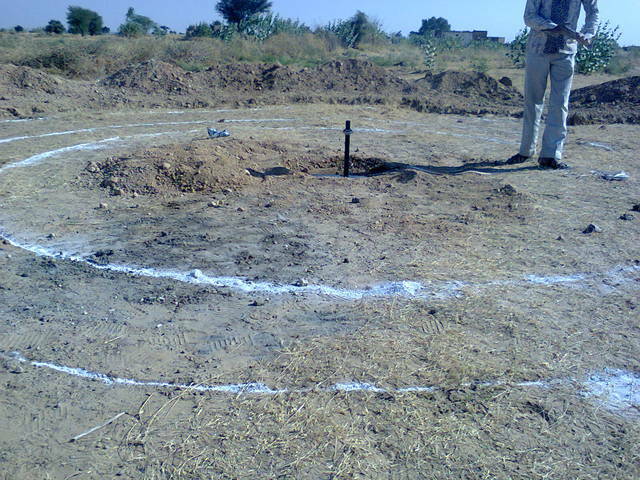 The PCC of pivotal centre and the peripheral pit (track) was completed using cement, sand and kapchi at 1:2:3 proportion. The PCC was allowed to settle down for a week. As well as stone partition on the side of the peripheral pit was completed using mortar of cement & sand at 1:2 proportion. It was allowed to settle down for a week. The stone wheel was fixed inside the peripheral pit. Ball bearing system has been assembled in the central rod, the metal rod and the stone wheel for smooth rolling of the stone wheel in the peripheral pit all round the mill. The peripheral pit of the lime mill completed. 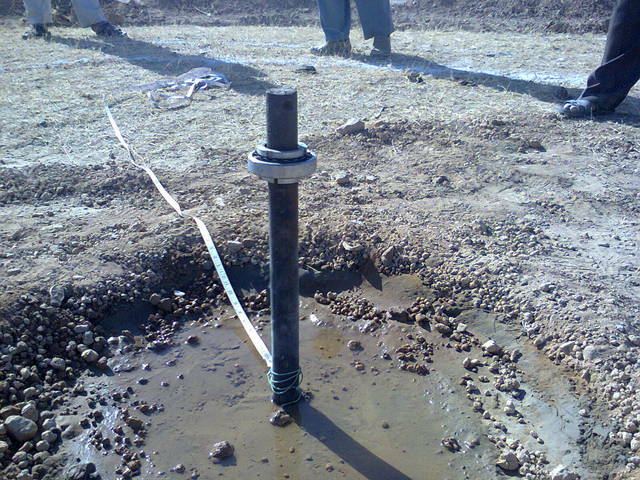 The work was delayed due to lack of labour availability (due to agriculture season). Even the labour demanded for more wage. Procurement of Metal rod done. Ball bearing assembly for casting in the central pit and ball bearing assembly( made of wood) for stone wheel was done. 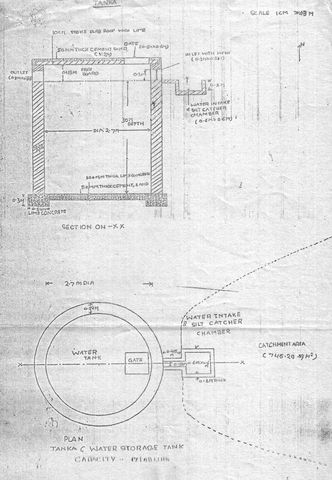 Due to misunderstanding of lime mill design, the peripheral pit of the lime mill was dug at 17' instead of 13'. so the peripheral pit digging work started again at 13' circumference. Previously, JCB machine was used to dig the pit but this time pit digging was done manually by labour. The pivot rod at the centre of the lime mill has been fixed. The central ball bearing for the stone wheel has been made. Dean and I departed from Baap centre at 8:30 after breakfast and reached Baap centre at 9:30 A.M. There we (Dean, Praveen, Shrikant, Devichand) had discussion about the issue of feasibility of lime taanka construction in Reen village and came up with conclusion that we will take Kishneri village for the 1st Taanka (test/experimental taanka) construction instead of Reen, as the grinding mill is also in the same village. 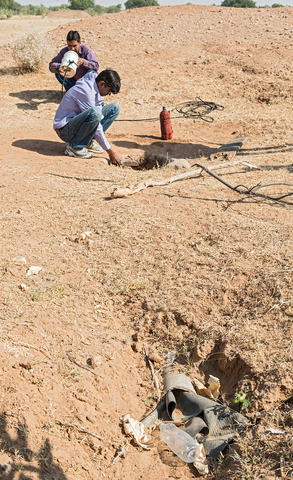 It would be easier for us to transport the mortar in the same village, understand how the mortar is working like the time for it to dry up, hold the stone bricks, mortar usability within the time it takes to after being transported to field village 45-60 kms away from grinding mill, etc. In short, it would be easier for the field staff to learn and draw inferences about lime construction work. We also discussed that we can construct cement Taanka for the beneficiary in Reen, as we had already promised the family for taanka construction and they have already dug the pit. Dean and myself departed for Jodhpur at 11:30 A.M and reached Jodhpur at 4:00 P.M (On the way to Jodhpur, we had our lunch and also visited Balaji Temple). Dean Forbes departed for Delhi at 10:00 A.M next day on 23.11.12. This note contains photos of beris that require renovation that I saw during my field visit with Gravis. This report contains photos of the naadi that we stopped at. 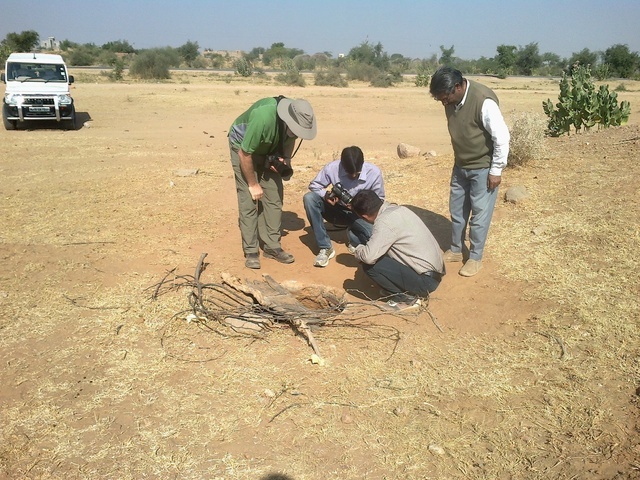 It is referenced in "Field Visit at Kishneri Village, Baap - Day 2 (20.11.12)" by Praveen Kumar. 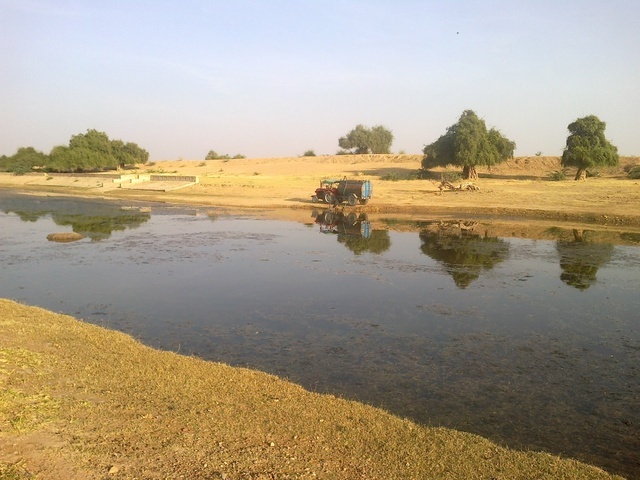 We (Dean, Saurin & Praveen) departed for the field at 8:00 A.M from Kalron Field Centre, reached the Baap Centre at 9:00 A.M. On the way to Baap, we visited a Naadi (pond) at Bhartasar village and took photographs of it. We moved all around the Naadi and understood its water flow, catchment area, spillway to control excessive water, steps & mud wall erected to hold the water, barricade of dirty railway track water by erecting mud bunds, rules made by the village committee for proper water management, etc. We (Dean, Saurin, Praveen, Shrikant, Devichand) reached Kishneri village at 10:30 A.M (we had our breakfast on the way and even vehicle tyre got punctured which consumed time to fix it back). 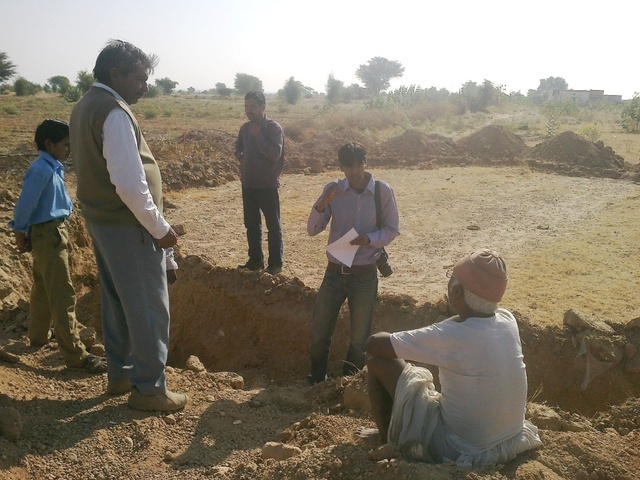 In the site where the grinding mill was constructed, we had brief discussion with Khanuram. Photographs were taken of the grinding mill. Masons and field staff were present there. Shaurin showed us a presentation with example of Taanka on how construction can happen with lime, the precautions to be taken and process to make lime mortar for construction. He gave detailed explanation on steps to prepare the grinding mill like pit digging dimension, central and track PCC, central pivot fixing, stone partition on track side, ball bearing in the wheel, etc. After field discussion we went to see the new Beri (1st test/experimental beri) which has to be renovated under the project. Discussion was done on how Beri works to conserve rain water. We also saw few already renovated Beris with cement superstructure. We confirmed to construct the superstructure with lime for new Beries to provide more durability as compared to the cement structure. Photographs were taken of the Beries. We visited some dilapidated Beries and understood the reason for it to be run down. The owner of the Beri said us that due to excessive water storage and absence of superstructure the Beries have rundown. We discussed that in future such collapsed Beries can be converted into Taanka. The owner of the Beri invited us to have a feast of sweet & delicious desert cucumber (locally called Kachar). 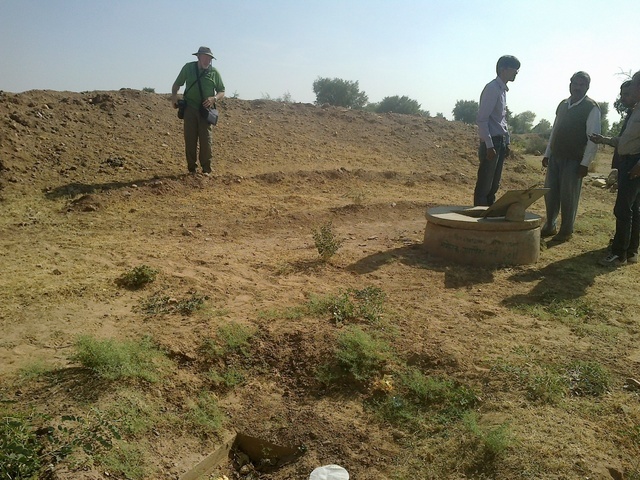 We also visited a Taanka constructed out of cement by GRAVIS in the same village. We discussed some details about the Taanka like, size, capacity, catchment bed, silt catcher system, beneficiary contribution, etc. Water samples were taken of Beri and Taanka as well. We had a prolonged discussion with one of our beneficiary Jeevanram, he had a Beri about 50-60 years old and he has constructed a new one also. 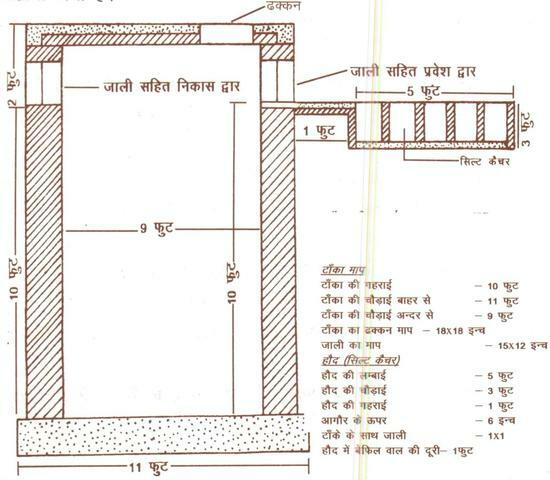 We understood about the different layers of the earth surface which has to be dug during Beri construction. 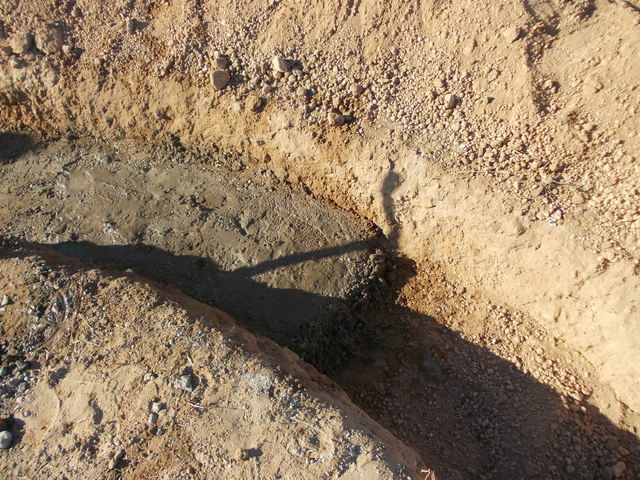 The layers are primarily categorized as Top surface (consisting of soil, sand and porous soil), Middle surface (consisting of soft and hard rocks) and Bottom surface (consisting of clay soil). These 3 layers are of different depths. Photographs were taken of all the layer and physical structures. 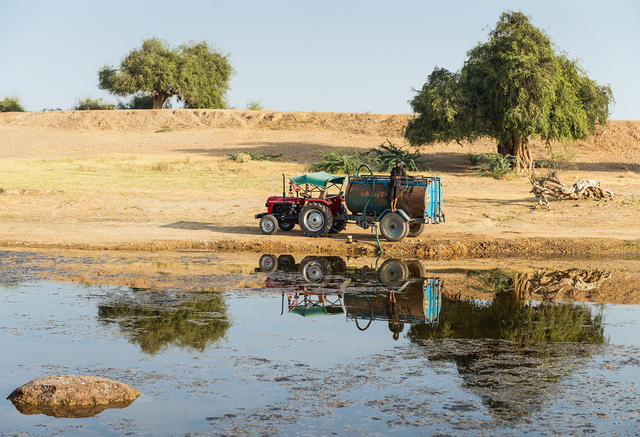 After our lunch we went to visit the Percolated Beri in the pond at Nokra village near Bikaner. The pond had about 60 percolated beries dug everywhere in the bed. Though the pond had dried up but all the Beries were full of percolated water. Some of the Beries super structure had been renovated by GRAVIS before, but still more than 50 % of the Beries needs structural renovation. 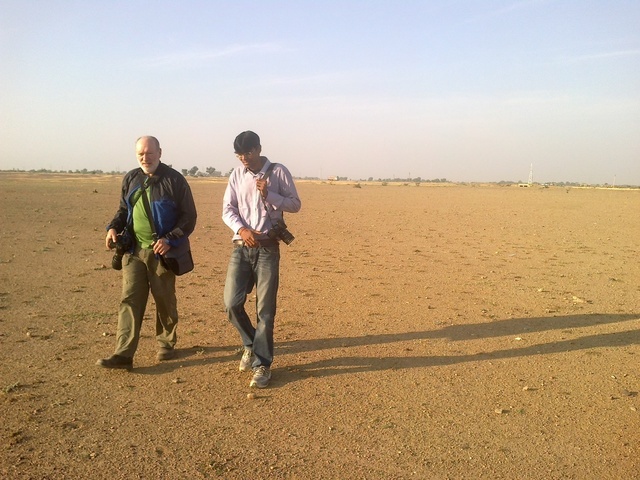 Then we departed for Bikaner and reached there at 5:30 P.M. 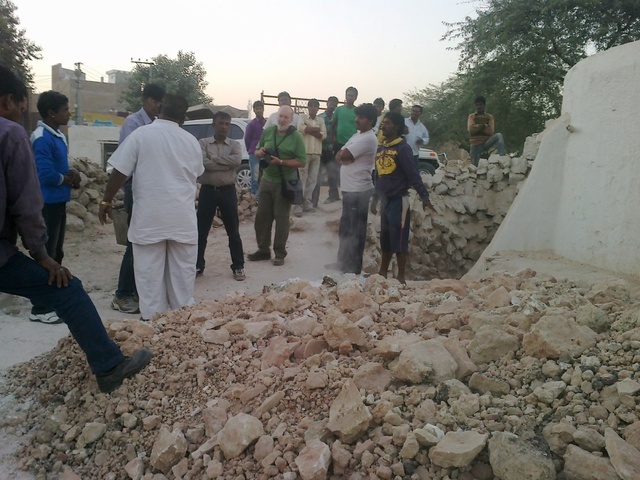 There we visited a Lime Bhata near Gajner and met the lime contractor Jahurddin Khan. He explained us the whole process of converting limestone into lime. He told us that the Bhatta needs to be kept lit up for 24 hrs and the existing Bhaatas has been lit up continuously from past many years (20 years as said by a labour working there). 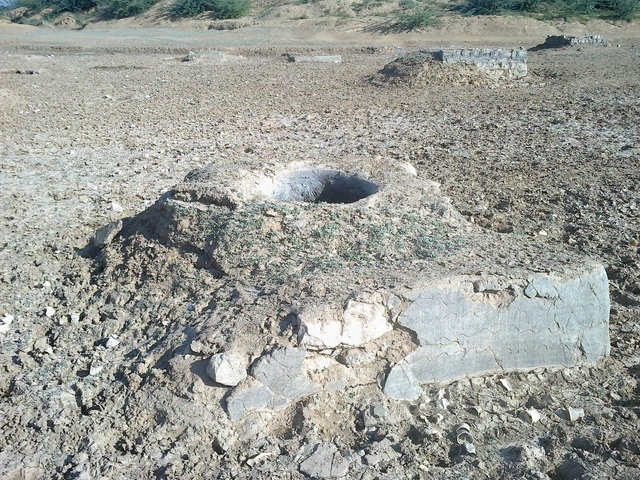 The Lime Bhatta had layers of limestone and coal in it which gets heated up and burnt evenly to be converted into powder lime after treatment with water. Photographs were taken of the activities. We also visited Jahurddin Khan’s House which was constructed out of lime. We were really amazed to see the fine lime work on walls which had a shining effect like ceramic. After that we dropped Shaurin to the railway station and reached back to Kalron Centre at 11:00 P.M and had our late dinner. These photos were taken during two visits to the village-site of the lime mill. Construction was behind schedule when these visits took place due to a reported labor shortage. Dean Forbes and Saurin Shah arrived at GRAVIS’s Jodhpur office in the morning at 9:30 A.M. We (Dean, Saurin and Praveen) had discussion with Dr. Prakash Tyagi about field visit plan and expectations regarding the project. We all left at 11:30 A.M for Baap field office (180 kms away from Jodhpur) and reached there at 4:30 A.M. (On the way to Baap, we had our lunch and also visited Osian Temple). After reaching Baap we had brief interaction with Shrikant Srivastava (Project Field Staff) and Devi Chand Mishra (Field Engineer) and departed for the project villages. 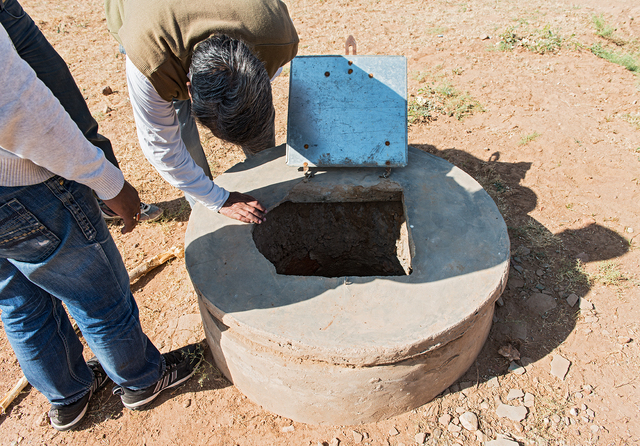 We visited Kishneri village, one of our 5 project villages, where the lime grinding mill was set up. Reaching the village site, we noticed the progress of the grinding mill. 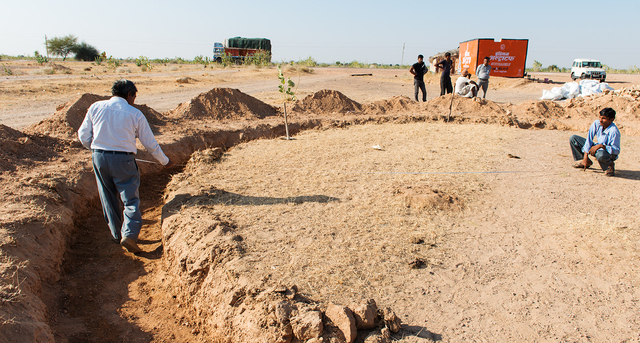 The digging of mill’s track (periphery) was completed. The grinding wheel (of stone) and lime bags were already purchased and transported to the site. We had discussion with Khanuram (representative from community) about our plan to construct the Beri and Taanka with lime. 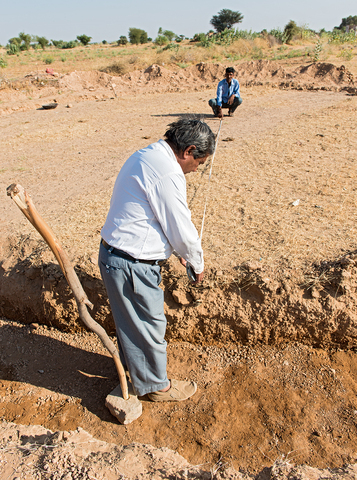 Khanuram is the person who does day to day monitoring and progress of the mill, as the mill has been dug in his land near to his shop close to the highway road. 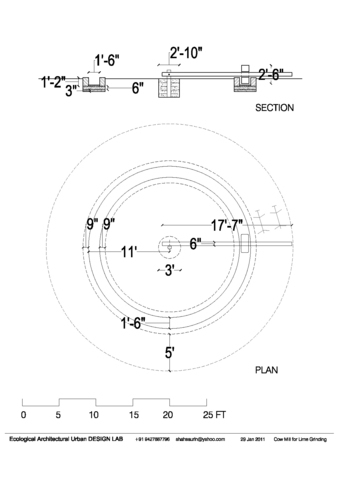 Shaurin suggested the field staff to fill up the mill’s track (periphery) as it was overdug compared to the wheel’s width and diameter. 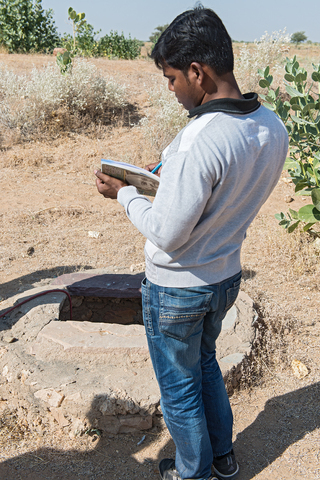 Next day plan was made to come back to the field as early as possible and visit the water structures in the village. As it was already dark, Dean was not able to take the photographs. We left for GRAVIS’s Kalron Field Centre and reached there at 8:00 P.M, there we had our stay and dinner. We received the lime order. 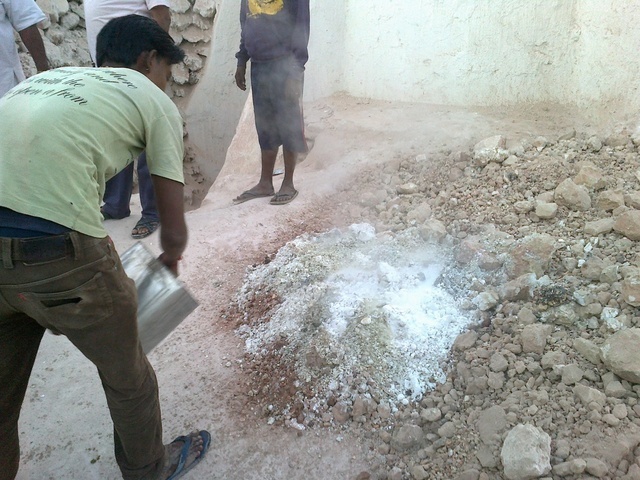 30 Quintals (3000 kg) of lime received. 60 bags of lime containing 50 kg of lime per bag. 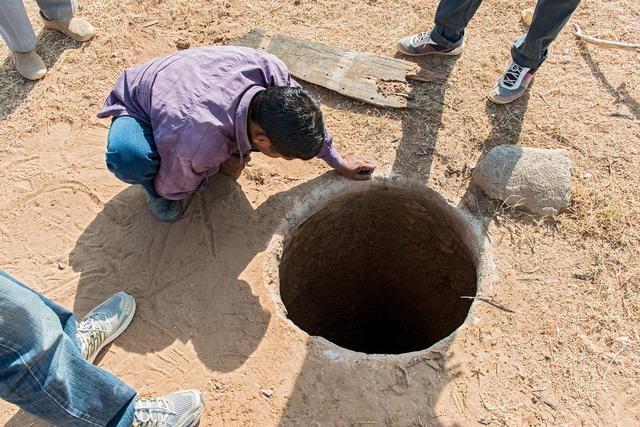 The bag was stored at Khamuji's shop near the lime mill at Kishneri village. 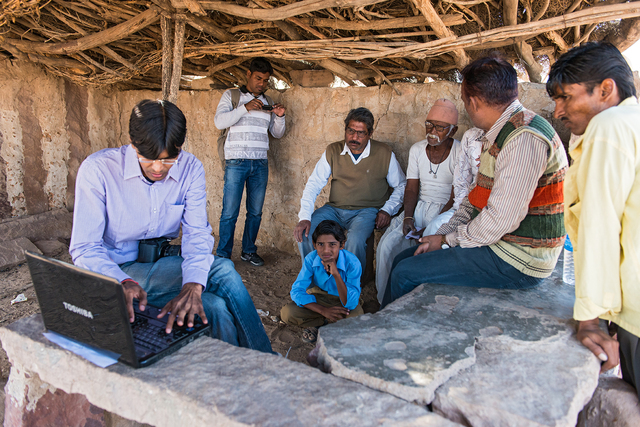 Khamuji is the community representative and has been associated long with GRAVIS. Stone wheel for crushing the Lime was procured from nearby village. The lime was purchased from lime shop Shree Krishna Cement at Baap. Shop owner Mr. Ajay Kumar Joshi ( 09414703316). The lime is brought from Gotan, Nagaur near Jodhpur (115km away from Jodhpur). 30 Quintal (3000 kg) of lime was purchased at the rate of Rs. 4 per kg. 60 Bags of lime containing 50 kg of lime in each bag. May be if we will purchase loose lime in coming days then the rate per kg will decrease. 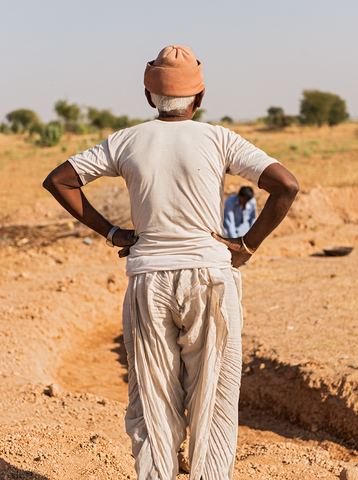 The Lime has been stored in Kishneri Village at Mr. Khamuji's shop near the lime mill. 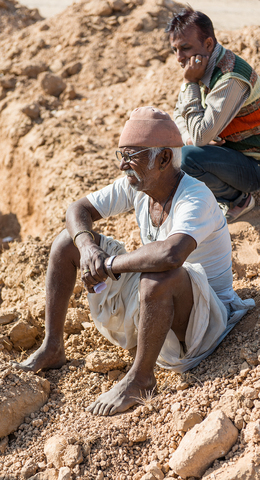 Khamuji is one of the active community representative associated with GRAVIS's development work from long time. 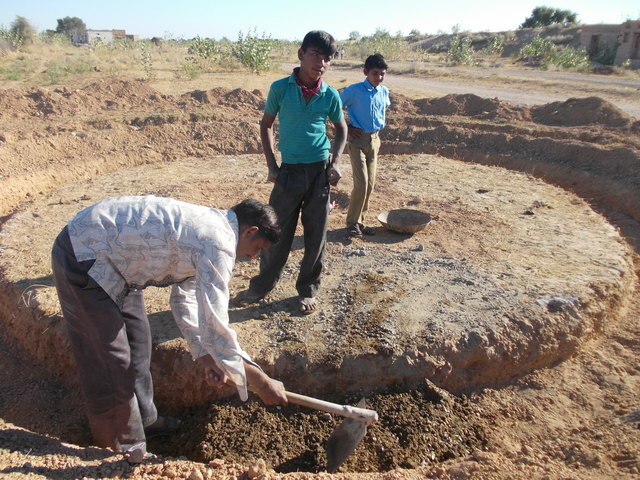 Pit Digging of Lime Mill started at Kishneri Village.The pit digging done according to the design and photo send by Saurin. The team had earlier discussion on design, place and responsible person for monitoring the work of Lime Mill. 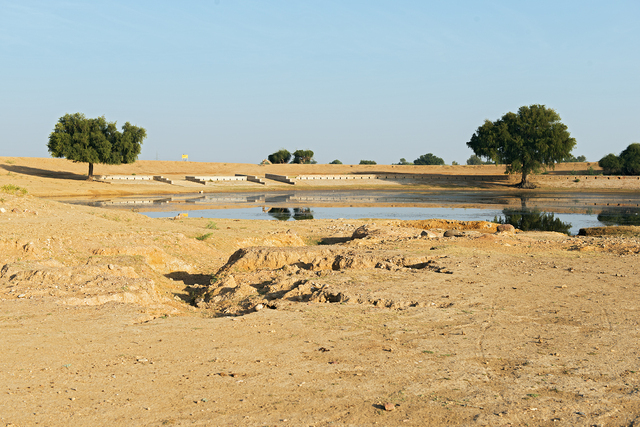 The Lime mill place is in Mr. Khamuji's land at Kishneri Village. 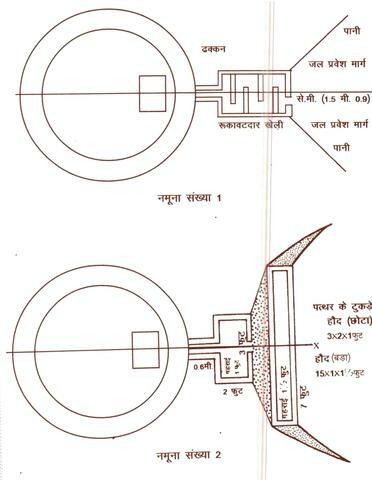 Khanuji is associated with GRAVIS's developmental work since long time. He will be directly involved at village level in day to day progress of the lime mill and other construction of water storing structures. See results attached, it's not the best but it's meeting standards of BIS for masonry work. Please inform price to decide holistically. Tomorrow it will be difficult to dispatch due to diwali coming up. If we don't order now, we will not have material ready by 19th. I have received lime sample today and given for the test as per Indian Standard Code for checking 5 contents. Reports to be received by tom. hopefully. After which order can be placed. Shrikant ji, please inform price of lime, location of where the lime is extracted from ground (is it gothan?? do confirm) and contact info of the source of lime trader to know more about the characteristics of lime. -Shrikant ji is looking for masons who has worked in lime and hopefully we will touch base today itself on this. -Local lime from Phalodi will be looked into and hopefully samples will be sent today. Please prepare the mill using cement now as it will take two days for setting. so that once we decide on lime, we would have the mill ready. hope you have the drawing and photo by now. Call me if you have any queries/concern. I would like to have conference call with you and your mason, as soon as possible. so that in this week most of the work would be done and following week the reaction of lime mixture will take place by itself. In the above 5 villages already Village Development Committee (VDC) exists who will help us in implementation of activities and regular monitoring of the progress. We will collect data of all the 25 Beris and it will be updated to you soon. 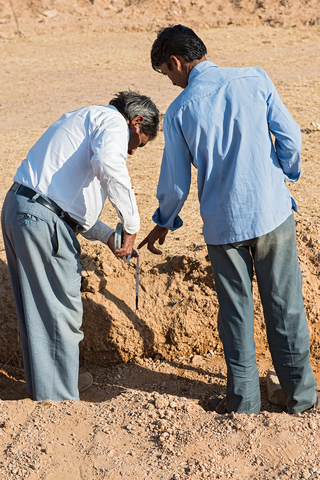 · 3 Masons selected (Mr. Sayiram, Mr. Jewanram and Mr. Govindram from Khidrat and Kishneri village) These Masons have experience of lime work construction but not with Beri. E.) We will set up the Grinding mill in Kishneri village. Shrikant ji is having some queries regarding setting up the grinding mill. Hopefully he will call u or we can have conference call today. Saurin called me at noon about the pending visit by him and Dean to Gravis. Saurin was very concerned that the first visit would not be action-oriented if adequate preparations were not done. So we had a conference call with Praveen. Saurin explained the process of making lime and that it would take 15 days and we needed to start today so that everything (materials and people) would be ready on the 19th. Identification of the villages where we would renovate beries. 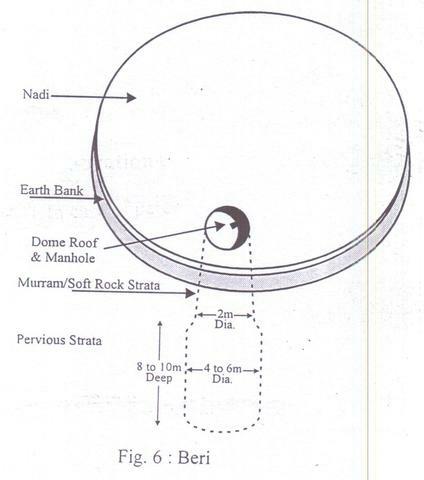 Some information about the beries (depth, diameter) and their current condition so as to estimate the amount of material and effort needed to restore them. Connecting to the field offices so as to ensure they knew about the plan and resources need. 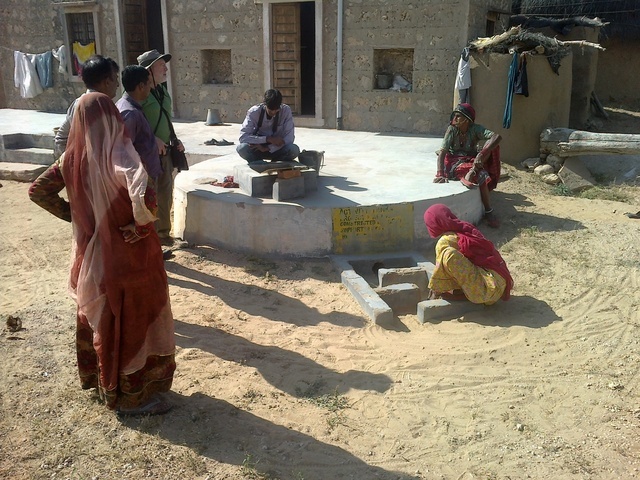 Identifying masons for each village. Elder ones who might have had experience with lime would be ideal. Of course, the more masons who were exposed and trained, the better. Identifying a central village where the lime mixture would be made. Need to find one that had the means (exiting mill or ability to build one) to create the lime mixture. The traditional cow mill (or camel?) has shown superior results to using a motorized machine. If a mill did not exist we would have to build one. 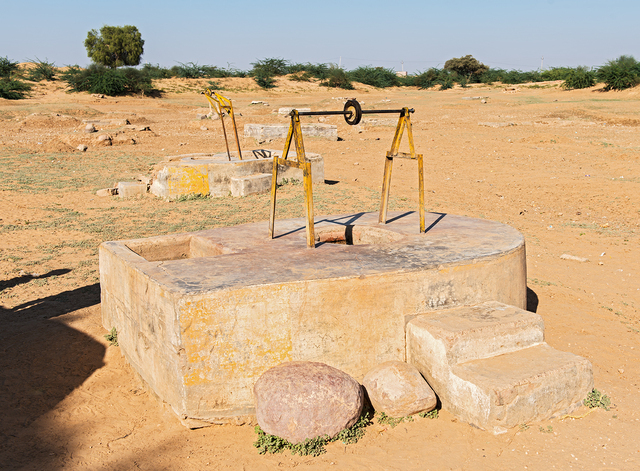 Could use parts from an abandoned well. Finding a source of lime. Praveen would go finding dealers and send samples to Saurin for him to approve. Saurin even explained how to eliminate bad lime or hydrated lime and only send worthy samples. Based on Saurin's approval, at least one truckload of lime would be ordered. Saurin explained us the process of making lime ready and the need for good quality raw material and the steps it takes to get it ready. 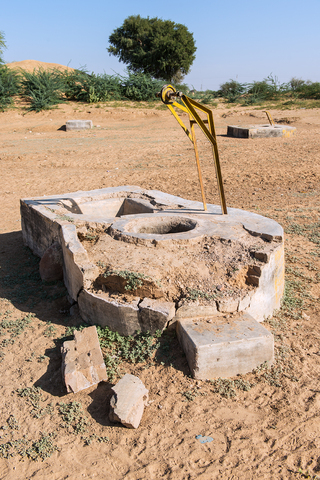 Saurin provided a diagram and a photo of the cow mill (attached) from Gujarat. Agreed to have a call later in the day - 4pm - to see what had been accomplished and make sure all questions were answered. We want to make sure things moved quickly on monday and tuesday. Personally, i was very excited by this one call. Not only were wheels set in motion, but also the process and the outcome would result in great capacity and skills to continue and scale up the work. Of course, we will track the results and even compare it with other means of repair and restoration.